ESP8266 pHAT also provides some GPIO, and one ADC channel, that is broken out for you to use alongside a small prototyping area where you can add sensors, or other components. 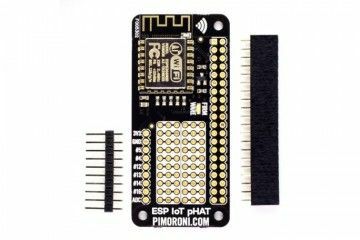 The MagPi described ESP8266 pHAT as "one for serious IoT project makers". ESP8266 pHAT doesn't have a Python library, like most of Pimoroni's other HATs and pHATs, but instead requires commands to be passed over serial from a terminal emulator like Minicom. Pimoroni's getting started guide shows you exactly how to get everything set up, including installing and using Minicom, connecting to WiFi, and polling for data. Note: This module is not a replacement for a WiFi dongle! It is designed for people who wish to experiment with the ESP8266 platform.